In this latest issue our new Master talks about the many highlights of his year so far, which includes his Installation at Mansion House last October, the commissioning of HMS Forth and the launch of a new campaign – Build A Career Without Limits. The campaign is targeted at young people looking for a career where they can develop new skills, build their qualifications and explore new avenues to support their ambitions. WCoBM is actively engaged with educational awards and supporting the training of individuals in and outside the industry so the campaign will become a long-term focus of the Company’s communications to improve the understanding of our sector. It is supported by a new video featuring personal accounts from individuals who have excelled in their job progression: http://www.wcobm.co.uk/about/build-your-career/. 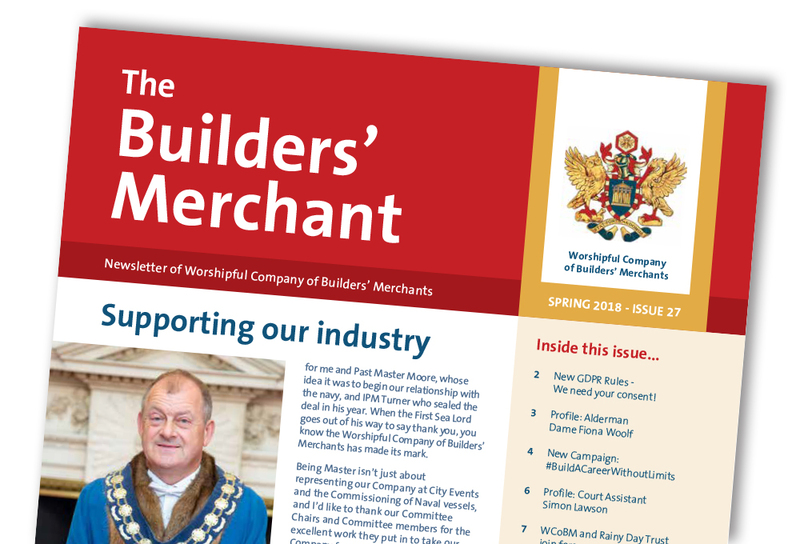 The newsletter also includes the latest member news, an update on our charitable work from Almoner John Poore, interviews with our Master Elect Pippa Latham, next Senior Warden Alderman Dame Fiona Woolf and new Court Assistant Simon Lawson, and lots more!